Home » Big Idea Tech Blog » Blog » A Virus on Your iPhone? Or a Tech Support Scam! A Virus on Your iPhone? Or a Tech Support Scam! A client recently asked us if it is possible to get a virus on your iPhone? He asked because his son had received a text message saying that his phone was infected and that he should call the phone number in the message for Apple support. The quick answer was, yes, an iPhone can get a virus, though it is not likely. However, if his iPhone did have a virus, he would not get a text message from Apple Support to inform him. In fact, they would have no way of knowing if his phone had a virus. This is not a virus. It is clearly a tech support scam. The Federal Trade Commission (FTC) warns that scam artists are taking advantage of your reasonable concerns about viruses and other threats. The scammers call, claiming to be computer techs associated with well-known companies, and say they’ve detected viruses on your computer to trick you into giving remote access or paying for software you don’t need. The software to “fix the problem” is worthless or available elsewhere for free, or it could actually be malware. The text message our client’s son received is a twist on these known scams. In this case, the scam artists sent a text message saying “your iPhone or iPad may have ADWARE / SPYWARE VIRUS” and you should “call Apple Tech Support” at the given toll-free number “to remove the virus.” It goes on to list the “possible network damages if [the] virus [is] not removed immediately.” (The possible damages they list as network damages have nothing to do with a computer network.) 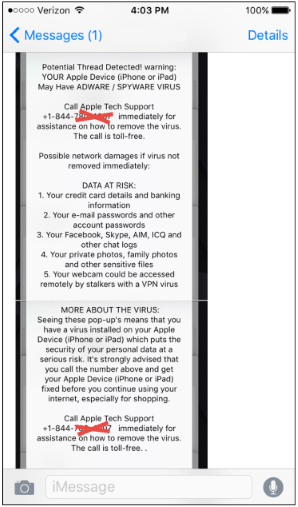 Further, it says “seeing these pop-up’s means that you have a virus installed on your Apple Device” and “it’s strongly advised that you call the number above and get your Apple Device (iPhone or iPad) fixed before you continue using your internet, especially for shopping.” (“This wasn’t a pop-up; it was a text message. Plural of pop-ups doesn’t have an apostrophe. And what makes it “your internet”?) Besides the fact that Apple would not send you a message telling you that you have a virus on your device (and they wouldn’t even know if you had a virus), the wording of this text message is not technically accurate and it is grammatically incorrect. Googling the phone number in the text message reveals that this number is associated with three websites, each a tech support company that indicates on the site that they provide “third party technical support for Software.” So, the phone number is definitely NOT Apple. The Google search shows that this phone number has “been reported” and “has popped up as an Apple Support Number associated with malware.” In other words, don’t call the number in the text message and ignore the text message’s warnings!! It is just a scam. Apple has strong security, which is why users ask if they even can get a virus on Apple devices. However, in recent years, iPhone users have been jailbreaking their mobile devices – modifying them to bypass iOS restrictions – and installing apps from sites other than the Apple Store, thus opening up their Apple mobile devices to malware. If you have jailbroken your device and installed apps from sites other than the Apple App Store, you could have a virus. Virus-infected Apps that were downloaded from unofficial sites are usually unstable and crash, or hang, or exhibit other odd behavior. Apple warns users against jailbreaking their Apple devices which violates their terms of service and opens their phones up to attackers. Do not jailbreak your iPhone or iPad. Only install apps from the official App Store, and pay attention to any warnings as you download apps. Install iOS 9 on your device (if you haven’t already); it is the most secure mobile operating system available. Be sure to install all official Apple updates on your iPhone; the updates are released for your security! If you are a Big Idea Tech client, you can call us with questions regarding wiping, restoring and setting up your Apple (or Android or Windows) device. Our team will be happy to assist you.